The Gulfstream G650ER is a favourite of our UHNW individual clients who want the best of the best in terms of private jet charter. This ultra-long range private jet is for the more discerning client. As the fastest ultra-long-range business jet in the world, the Gulfstream G650ER is one of the most coveted aircraft among the global travelling elite. This is due to its phenomenal range capabilities, industry-leading cabin technology and unparalleled passenger comfort. In today’s fast-paced international marketplace, the speed and quality of establishing business connections matters. 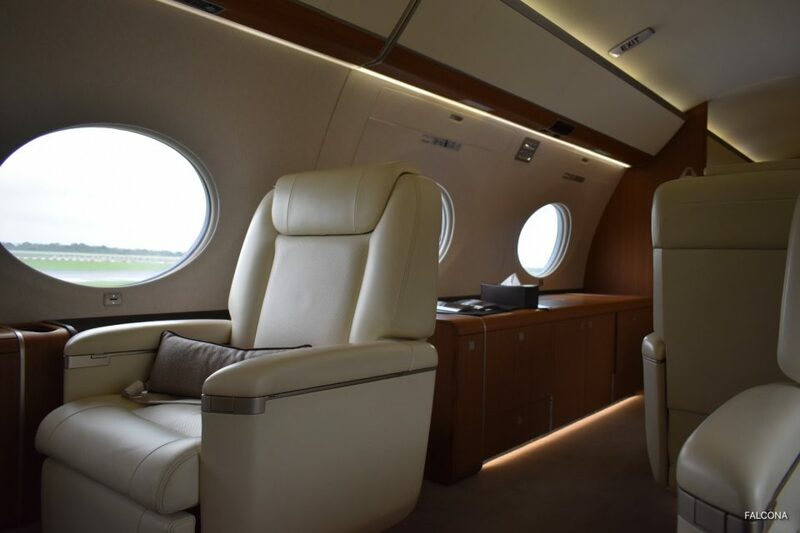 If your business needs includes flights half a world away, the G650ER offers the advantage of flying the fastest and longest routes possible by any business aircraft. No other platform in business aviation offers the combined utility of range, speed, performance and payload. The G650ER aircraft can easily fly non-stop from the Middle East to North America or from destinations in Asia to Africa. It can fly further, faster than any other jet of its kind, and is perfectly suited for those whose travels needs include flights halfway around the globe. The G650ER, extends the non-stop reach of the industry’s highest performance long-range business aircraft to 7,500 nautical miles/13,890 kilometers at Mach 0.85. Flying even faster at Mach 0.90, the G650ER will carry eight passengers 6,400 nautical miles/11,853 kilometers. 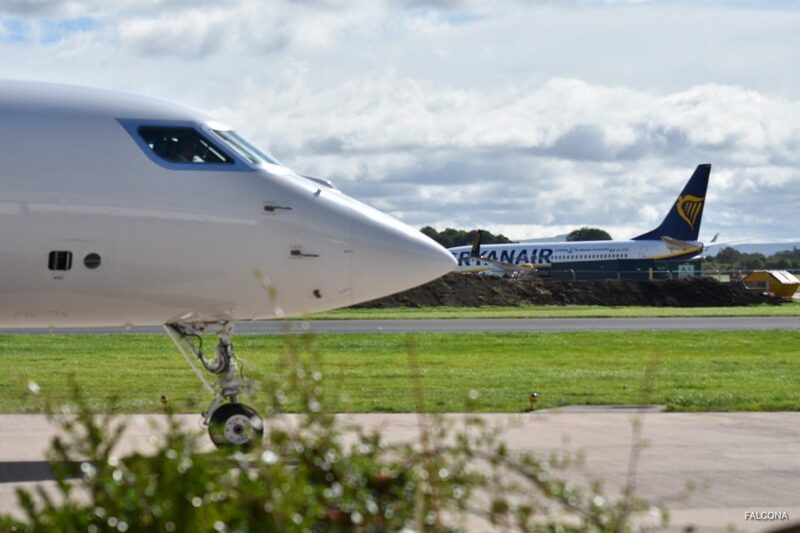 Both are feats that no other business aircraft in the world can achieve. The range capability of the Gulfstream G650ER allows you to access key city-pair connections such as Hong Kong to New York; and Los Angeles, California, to Melbourne, Australia. The G650ER boasts a maximum takeoff weight 4,000 pounds/1,814 kilograms greater than the G650, which can be an advantage in adding fuel margin or increasing long-range cruise speed on ultralong-range routes. The additional range capability of the G650ER significantly increases the number of non-stop connections possible between cities. From Dubai, fly non-stop to Atlanta. A dozen cities now connect non-stop with Sydney, including Riyadh and Dallas. 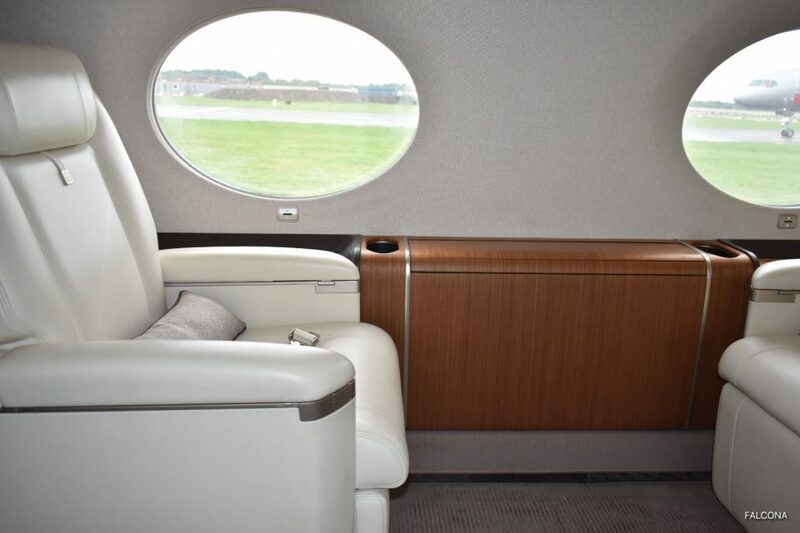 A Gulfstream G650ER cabin provides the ultimate blend of form and function. 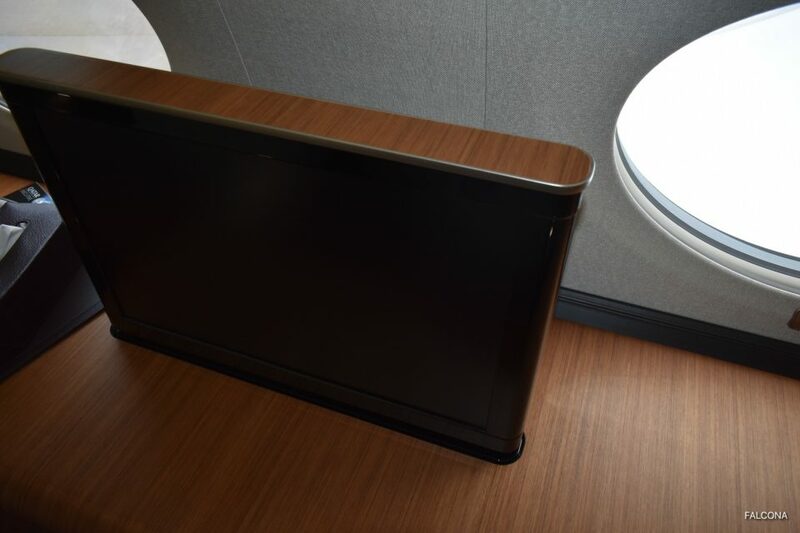 Flexible cabin design and the option to customize offers owners control of their environment―whether it’s the need for a private stateroom, a large conference space or individual work areas. The cavernous cabin accommodates up to sixteen passengers in up to four distinct living zones. Larger seats, a wider aisle and capable of having three across seating at the conference table for meetings or dinner for up to six people. Seats recline and swivel to accommodate your needs, berthing for sleeping on long haul flights or just for relaxing. Comfortable divan perform double duty as seating for take-off and landing or as a convenient twin size bed for sleeping. 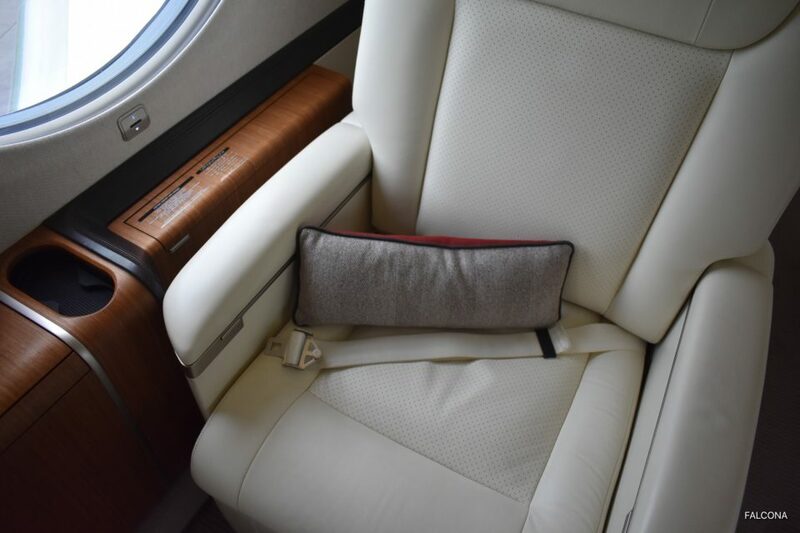 Wide seats and generous aisle spaces are benefits of the G650ER, and the sense of spaciousness is further enhanced by 16 Gulfstream panoramic windows, the largest in the industry, that stream sunlight into the cabin and galley. The windows are 16% larger and with its positioning, it will enhance your views during flight. 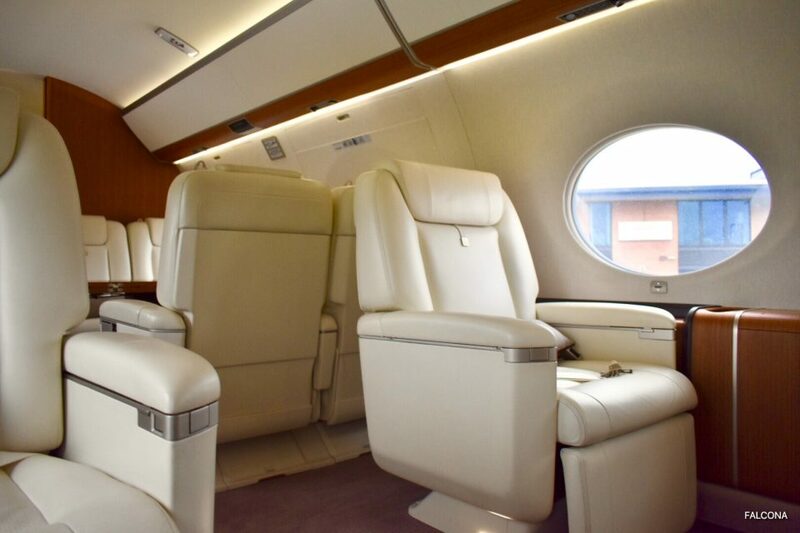 The G650ER cabin is replenished with 100 percent fresh air every two minutes. 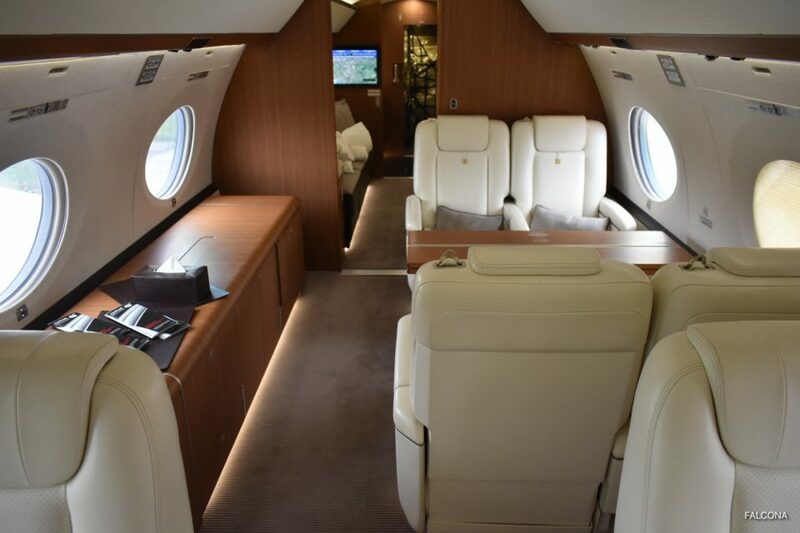 And with the lowest cabin altitude in the class, matched only by, the Gulfstream G650, passenger heart and lungs can more easily oxygenate the blood, which reduces fatigue and ensures a more alert and refreshed arrival many time zones later. Cruising at 51,000 feet above commercial traffic and weather, the Gulfstream G650ER is truly high-class. At a cruise altitude of 45,000 feet/13,716 meters, a G650ER cabin is pressurized to an altitude of 4,060 feet/1,237 meters. That cabin altitude is almost two times lower than commercial airlines and significantly better than any non-Gulfstream aircraft in the large-cabin class. 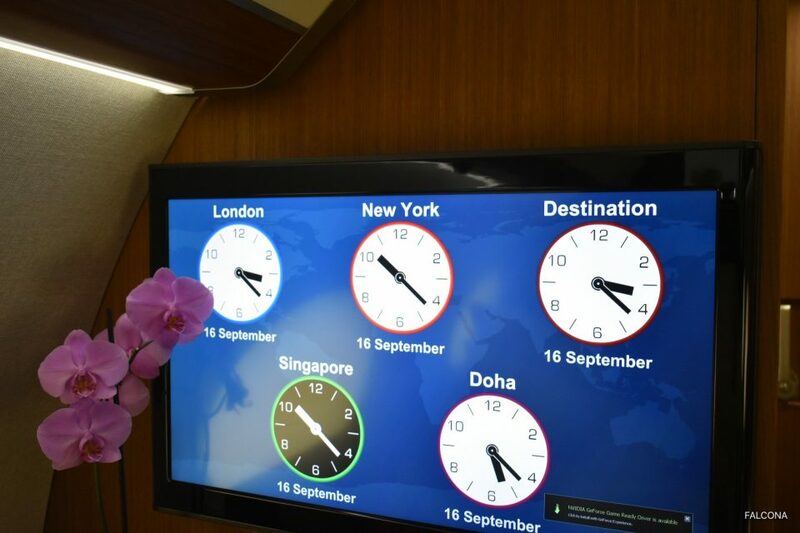 You will enjoy the Gulfstream Cabin Management System (GCMS), passengers control temperature, lighting, window shades and entertainment devices with Apple iOS or select Google Android touch-screen smartphones and tablets. Standard features, including digital audio and high-definition video equipment, 26-inch/66-centimetres widescreen televisions, convection oven, porcelain dinnerware, flatware and stemware with fitted storage, combine to outfit the G650ER with everything needed for flawless entertaining. Interior Blu-Ray, DVD CD player, high speed internet, satcom telephone, airshow, external camera system, forward & rear lavatory, 4 convertible beds. Apple iPod touch units or Google Android devices are provided to control the cabin, but the Gulfstream Cabin Management app is also available as a free mobile download for personal iPhone, iPad or Android devices, which allows passengers to save and recall preferences for subsequent flights. There is a large lavatory, which features a floor to ceiling closet and mirrored vanity with ample storage. A second lavatory is located at the front of the forward cabin. The G650ER has more usable baggage volume than any other business jet in its class. Up to 195 cu.ft allowing you to bring preety much everything including the kitchen sink for those long journeys. The galley is a full service galley of the highest quality. Your flight attendant will be able to serve fine dining meals from the hi-tech galley. The G650ER’s advanced flight deck provides the most critical information in easy-to-read formats, which help increase situational awareness and pilot response. State-of-the-art vision systems also help pilots see more and respond faster to changing flight conditions. With the Enhanced Vision System (EVS) II, a nose-mounted infrared camera allows pilots to see more than the human eye can. Detailed images of airports and surrounding terrain are enhanced at night and in low-visibility conditions. EVS images can be routed to a Head-Up Display (HUD) that feeds data onto a transparent screen in the pilot’s forward field of vision. 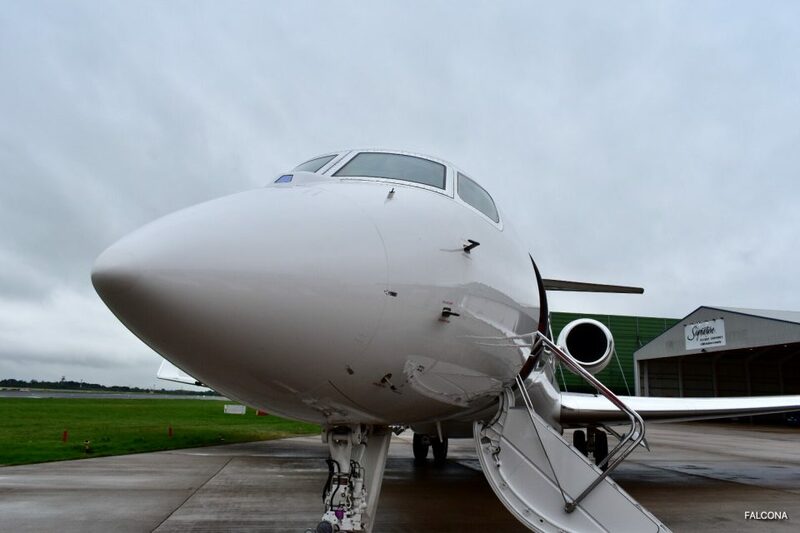 This G650ER aircraft flew non-stop from China to Manchester for a business trip. The link between Manchester and China is growing year on year. There are clear benefits for both parties and in particular Manchester especially as China is one of the world’s major economies. As part of the Northern Powerhouse Falcona is working to provide a seamless and direct link to China through private jet charter. 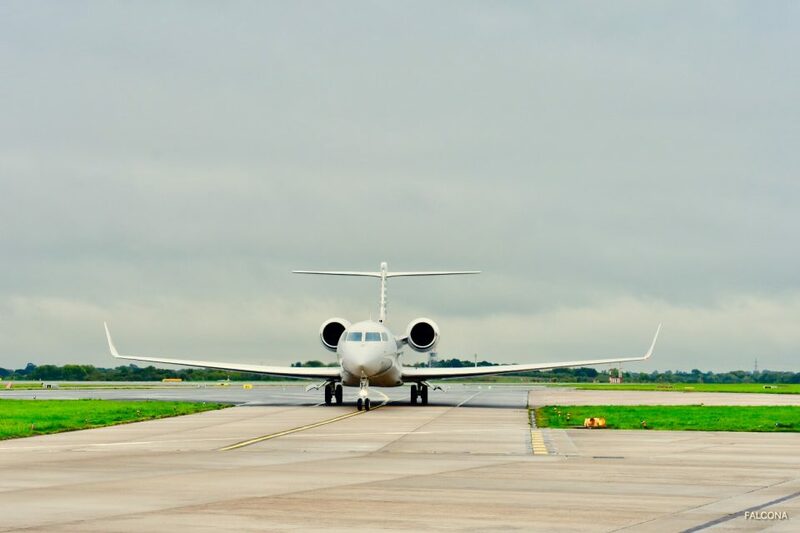 Whether you’re an investor or visiting Manchester for pleasure a private jet flight is the perfect way to arrive. It’s hassle free from the moment you book your flight. You can fly whenever you like with people that you know. The private terminal is offered to international passengers travelling to and from Manchester and features onsite Customs and Immigration screening. You will be escorted through security and to your departing flights, while passengers landing at Manchester are met at the aircraft and escorted to the terminal. When it comes to European or even world cities, Manchester deserves a position on any respectable bucket list. For business or pleasure, this characterful Northern city is not to be missed. Of course, for the football fan, there are two very good reasons to visit: the city is home to two of the world’s biggest football teams, Manchester United and Manchester City. Cricket lovers might head to ‘the other’ Old Trafford, whilst cycling fans will want to check out the indoor Olympic cycling centre. Manchester offers a superb and diverse range of restaurants, shops and hotels. Indulge in designer brand retail therapy at Selfridges and Harvey Nichols, both conveniently located in the city centre. In winter, join the thousands of visitors who gather at Manchester’s twinkly Christmas markets. The city boasts an impressive music heritage and the city’s MEN arena attracts top-selling music artistes. The Bridgewater Hall, home to the acclaimed Hallé Orchestra, hosts big names in the world of classical music. 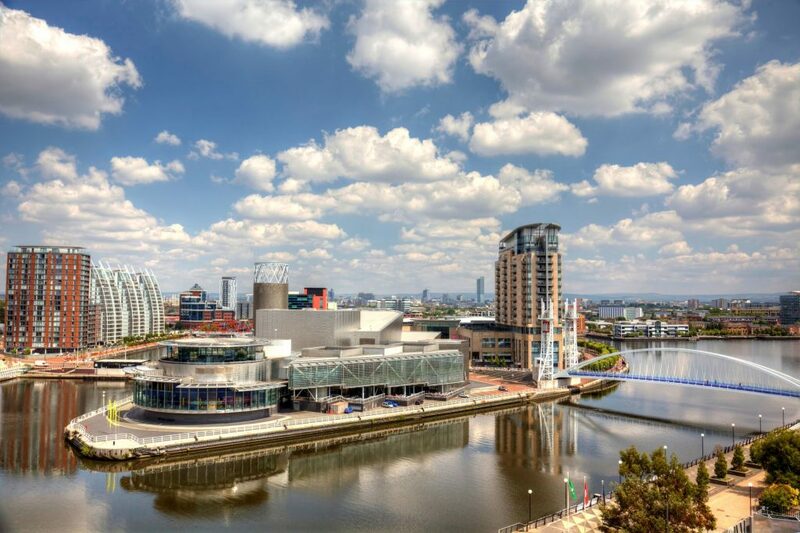 A recent study rated Manchester as the best European city in which to do business, which explains why many global businesses choose to headquarter their UK operations here. The MediaCity district is home to film and TV companies. Manchester’s quirky and youthful Northern Quarter has been transformed in recent years, with digital businesses making it their home and fashionable shops and bars springing up on every corner. As a destination, Manchester is large enough to offer quality and variety, yet compact enough to get around easily and wherever you go, you’re assured a warm Mancunian welcome. If you would like to charter a Gulfstream G650ER , whether it’s for business or pleasure, then let Falcona organise your next trip. 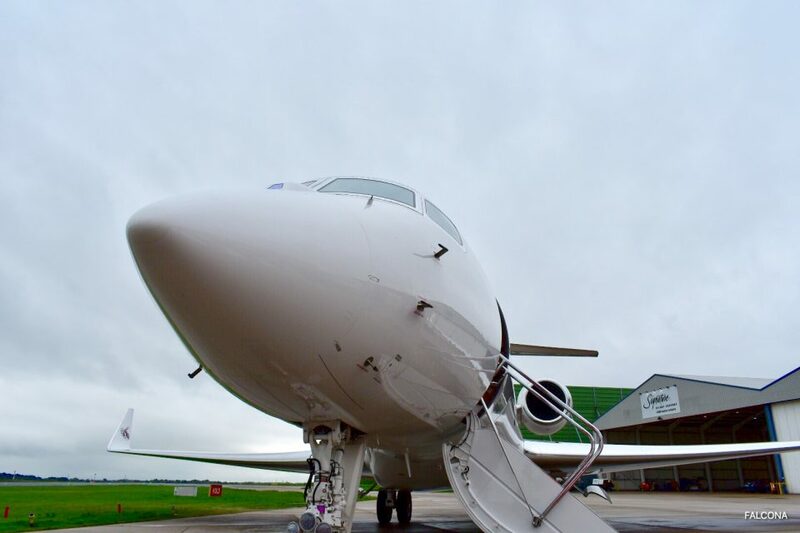 With our bespoke service you can charter a private jet with ease.